Poisonous Portuguese Man o' War have been sighted washed up on some west Anglesey beaches, including Porth Dafarch and Borthwen. If they come into contact with these siphonophora, swimmers can receive a very painful sting which may cause a strong allergic reaction. Normally the Portuguese Man o' War is found in subtropical and tropical regions of the Pacific ocean as well as in the open seas of Atlantic which are within the Gulf Stream. As the island is close to the Gulf Stream it is conceivable that these siphonophora (not Jellyfish) could be carried towards the western beaches of Anglesey by a certain combination of strong south westerly winds and tides. While they have been spotted at Porth Dafarch beach and Borthwen beach, it is possible that they may be in the water at other beaches in the area. For those who may be thinking about swimming off Anglesey beaches over the coming weeks, the advice from Marine Officers on the island is to be extra vigilant. Contact the Council maritime department if you spot any unusual creatures in the sea or on an Anglesey beach. 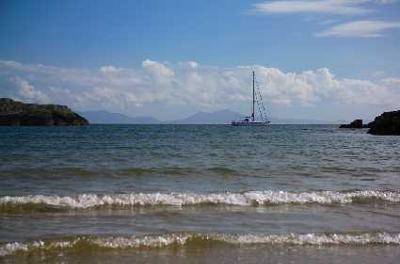 We are happy to read these articles about the Anglesey coast from your website. Our essay services are all helpful to learn some educational reviews and essay writing tips for my students education. I have heard about the jelly fish attack in Anglesey beaches when I was there before two months. And also I have seen few victims of jelly fish attack. Their body affected with some sort of allergic reactions. I guess they are feeling better now. You can at least see these, as the top of the beast sticks out of the water, looking like a strange boat with a sail. well, i think if you are worried about these jelyfish just put on wetsuit and plastic shoes.